Today I tried out Zerply which is another new entrant into the “business card on the web” services. You can easily and quickly create an account by authenticating with Twitter or Facebook and then bring over your work experience by authorizing LinkedIn to import it. You can then supplement your knowledge and skills with keywords and tags. Then you can add many of the services supported to your profile and even add external ones that aren’t supported. I learned of this new service from Louis Gray’s post in which he likens it to Flavors.me and About.me. After playing with it for a little while though, I wouldn’t quite make that comparison. Sure some of the same on-boarding process and features are there, but ultimately you don’t end up with quite the same robust profile that’s available on those services. With Zerply you’ll be able to import your LinkedIn experience and selectively edit it on your page as well as add 3rd party services. But your profile will only show the work experience statically from the import and only provide links which ship you away from your profile and onto the 3rd party sites. In both Flavors.me and About.me’s case you get a dynamic stream from those site on your profile page. This is a key differentiator between these services and Zerply. 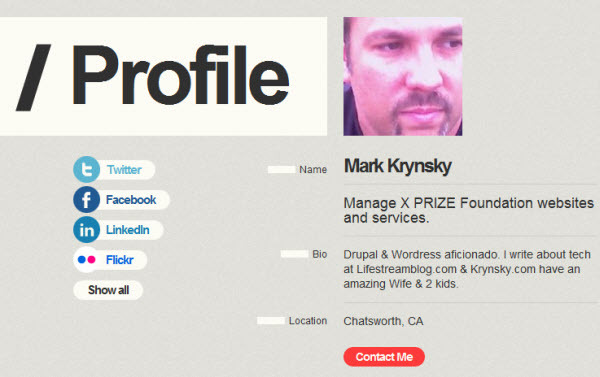 Beyond that you have a choice between 3 custom themes for your public profiles but nothing much else in the form of editing your profile. After you create the account there seems to be a component to add influence metrics to users by offering up endorsements for people’s skills that they’ve submitted and an ability to create an address book. I’ll give them the benefit of the doubt on their early launch and I if you’re curious to try it out and see if some of features are of interest, I wouldn’t sway you otherwise. You can also learn more about the service by visiting Louis Gray’s post. Hey Mark, thanks for checking us out! You’re absolutely right to suggest we don’t quite sit alongside services like flavors and about.me, who are personal splash pages with all the bells and whistles. Our focus is more about discovering new people who also ‘love what they do’ and managing your professional web presence in a neat and concise way. Hope you can keep tabs on us as we continue to develop the product.